In 2014, I decided it was time to set some goals for myself. Why? Good question. I had a bunch of things I knew I wanted to accomplish, but I was not keeping track of them very well. My energy was divided among a bunch of things, with little progress in any of those areas. Obviously, this didn’t work out, because I became VCDX-236 in November of 2016. Does this mean I never met my goal? Of course not. What I now know I should have done is had a space on this page for revisions. There are more similar pages in this notebook, some of which I met in my subscribed timeline, and some I did not. It is important to remember that goals are allowed to be flexible. As I learned in my quest for VCDX, sometimes life happens, and the original timeframe you set for a goal needs to change. I think many of us are afraid to set goals for ourselves, because we’re afraid of what will happen if we don’t meet them. 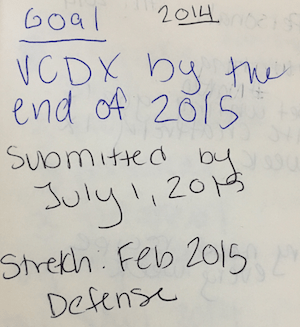 I had been talking publicly about becoming a VCDX since 2014, but obviously it did not happen until two years later. This does not mean I failed at my goal, or I am a bad IT architect because it took me so long to achieve. It just meant my journey took a different path than I originally thought it would. There are also many more lessons I’ve picked up along the way included. I’m working towards determining the exact date this book will be available, as well as launching a website to go along with it. Stay tuned for more details! 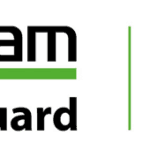 For more about the IT Architect Series, be sure to check out the website. If you are going to be at #VMworld2017, and want to talk more about setting goals, come find me. I’ll have something special for you to help get you started.